Alternate battery charger-regulator circuits, presented for information only. I didn't build these because I had the gel battery, and the circuits of Figs 2 and 3 proved to be perfectly adequate. Had the charging panel been unable to maintain the battery adequately, a low dropout charging regulator could have been used to reduce the headroom requirement from about 2.35 volts to around 0.85 volts. This would allow the battery to be charged (some) under most overcast situations. A circuit is shown below. *R1 is selected for 14.06V, measured at the battery terminals, with jumper J1 (Figure 3) removed. J1 jumper removal simulates 0°F (installed for normal operation). Had the temperature compensator circuit not been used (nothing connected to A, B or C), R1 would be selected for 13.6V. 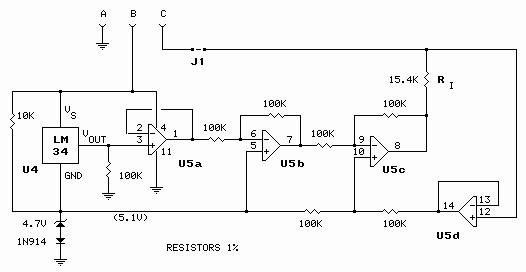 Note: This temperature compensator circuit is not compatible with the Figure 2 regulator circuit. Another option would be to eliminate the charging regulator entirely, reducing the dropout to about 0.35 volts, but, unless the solar panel is very small and the battery very large, it would not be a good idea. A "12-volt" solar panel can easily put out over 20 volts on a bright sunny day, risking battery overcharge. *R sets charge current. R = 1.25/I, where I is the desired charge current in amps. The charging regulator is not needed if the short-circuit current rating of the solar panel does not exceed 0.1C, one tenth battery capacity.